In our own fleet of temperature controlled vehicles, we deliver to UK wholesale markets, retailers, packers, processors and the food services sector. The fleet is tracked to enable us to give up-to-the-minute information on delivery times. Trailers are kept at optimum temperature for individual produce types, or at +7 degrees for mixed loads, and temperatures are monitored and reported to ensure quality is not compromised. 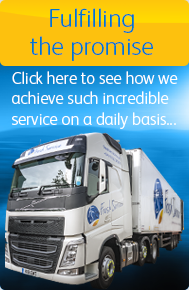 Supported by our 24/7 transport desk, our experienced and friendly drivers are able to resolve any issues around the clock, letting customers sleep soundly in the knowledge that their produce is in professional hands. As we’re on London’s doorstep and deliver to the London markets nightly, our modern vehicle fleet exceeds the required EU exhaust emission requirements, meaning we can operate within the London Low Emission Zone without penalty.